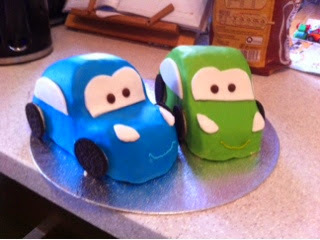 Oliver's birthday car for his third birthday. Can you guess he likes cars! A Baby Owlet vest made for my little nephew for his christening present. The cake I made for my nephew's christening. 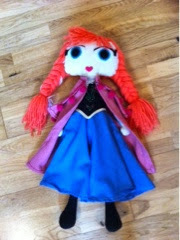 Emily asked if I could make her an Anna doll to go with her Elsa doll, whenever I had the time. So I obliged. Well, she did ask nicely! She was a bit more complicated than Elsa, with a fancy embroidered bodice on her dress and a two-layered cloak. She's not exactly like the movie, but she's a pretty decent Miss Aine version. Here are the Frozen sisters together. I have a pretty happy daughter!